Rhinoplasty is a well known nose reshaping procedure that is commonly performed. While every patient who undergoes the procedure knows there is going to be a recovery period, it is understandable that most patients do not appreciate what is involved in the recovery and how long it really takes to see the final outcome from a rhinoplasty procedure. The first week after the surgery a dressing that is applied at the end of the surgery is maintained. This combination of tapes and an overlying metal or plastic splint is used to achieve two goals. First, without it the nasal swelling would be very significant and would create a lot of nasal shape distortion that would adversely affect the final result. Besides decreasing the amount of swelling that will develop over the nose, it also helps push the skin back down onto the reshaped osteocartilaginous frawework. This skin compression prevents a lot of blood from forming between the skin and the underlying cartilage/bone. This prevents a lot of scar tissue formation which could thicken soft tissue layer and mar what was done underneath to eventually be seen on the outside. Classic bruising under the eyes is a postoperative sequelae only when the nasal bones are broken or osteotomized. The presence of an external nasal dressing does not prevent the bruising from occurring or help it to go away any sooner. Such bruising resolution runs a classic time period of three works before it completely goes away and will undergo color changes with colors that occur from the breakdown of the hemoglobin in the blood. 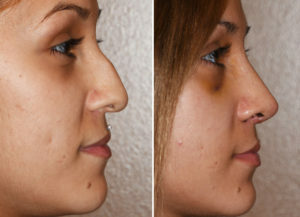 When the external nasal split is removed the shape of the nose often already looks improved. This may or may not represent what nasal shape may eventually be seen when healing is complete. But this is not the time to judge how the nose will eventually look and this is a much longer process. Also be aware that when the dressings are removed there will be some rebound swelling that will develop now that the nasal compression has been removed. In other words be forewarned that the nasal shape will look worse days later and is expected. Ideally long term nasal compression would be helpful but the prolonged wearing of a visible nasal splint and its potential pore-occluding effects make the impractical. Once the nasal splint has been removed, the real aesthetic recovery from a rhinoplasty begins. The resolution of bruising and swelling as well as the shrinkage of the skin over the reshaped cartilage and bone (the so called shrink wrap effect) is a process of three to six months from which the ongoing smallest changes at the tip can take up to a full year or longer to be seen. This is why I tell patients, who understandably can not help trying to judge the outcome as soon as the splint comes off, to refrain from any critical judgments of the new nasal shape for a long time. Much will change from splint removal to the first anniversary of their rhinoplasty surgery date.